Thanks to distilleries like Headframe Spirits, small-batch liquor no longer has to give up quality to gain scale. We take a look at mass market distilling. 1. The fermented liquid created from the mash, called distiller’s beer, is pumped into the system at a rate of 8 litres per minute. This keeps approximately 150 litres in the still at any moment. 2. A heat source at the bottom of the column heats the distiller’s beer to 100 degrees. The alcohol and water vaporise and rise to the top of the first column, where they are transferred to the second. Any grains or impurities from the distiller’s beer (called tails) remain at the bottom of the column and are removed. 3. The lower temperature in the second column allows impurities to liquefy and fall to the bottom as the alcohol vapour rises and is transferred to the third column. 4. The process continues, with more impurities falling away in the third column as the alcohol vapour continues to the fourth column. 5. In the fourth column, the purified alcohol (hearts) condenses, allowing the toxic methanol vapours (heads) to exit via the top of the system. The alcohol is drained out of the bottom of the still. In Butte, Montana, hard-rock miners used to lower themselves 500 metres underground to tap out copper ore. They mixed dangerous handwork with rudimentary mechanics. John and Courtney McKee wanted to continue that innovative legacy when they started Headframe. The distillery is named after the structure that supports the hoisting pulleys over a mine shaft. Each spirit is named after an historic mine claim. At the craft level, traditional pot distilling is done in batches. As fermented liquid is heated, different parts boil off: first the heads, which can be toxic, followed by the hearts, or principal ingredients, and the tails or leftovers. The craft is knowing when the heads finish and the tails begin, and keeping only what comes in the middle. It’s a time-consuming process. In response, major producers developed continuous distillation. Fermented liquid is fed into the system at the same rate that it is boiled off, so it is a rolling process with no need to stop. Those stills “are so expensive and so large we couldn’t even make enough mash to turn one on, let alone run it,” McKee says. 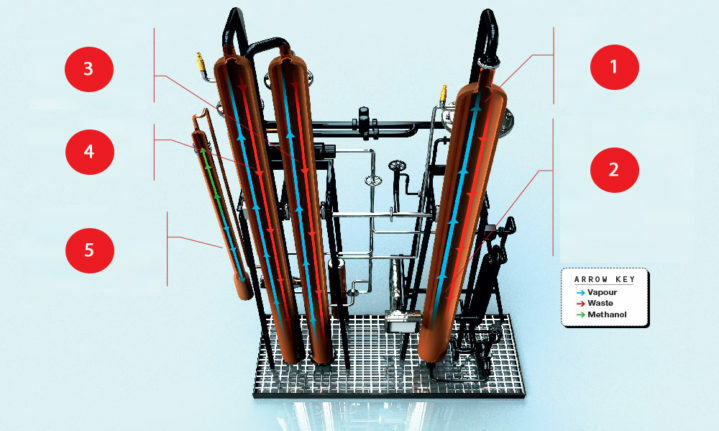 A former biodiesel distillation and renewable-fuel expert, McKee enlisted a few friends from his former career and ­rescaled the technology (above). Makes an awesome root beer float. Really.